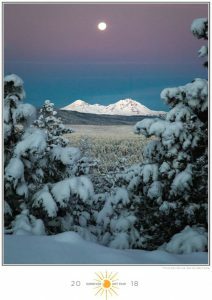 The Sunriver Art Fair is organized by the Sunriver Women’s Club. 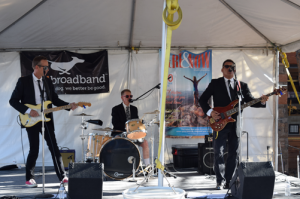 Net proceeds from the Sunriver Art Fair support non-profit agencies in Deschutes County. 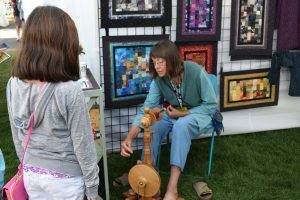 The Sunriver Women’s Club will sponsor the 10th Annual Sunriver Art Fair on August 9-11, 2019 with over 70 artist booths exhibiting art in 11 different mediums: ceramics, glass, jewelry, painting, photography, sculpture, textiles, gourd art, woodwork, metalwork and mixed media. Artists are come from as far away as the east coast and right here in the Pacific Northwest. Enjoy a meal at one of the many local restaurants, then join in the fun at the Entertainment tent – a great addition to a day of art! The 2018 Sunriver Art Fair Commemorative Poster by artist Holly Fischer will be available for purchase at the art fair. Click here to purchase this poster online. The 2019 Sunriver Art Fair Premier sponsor.